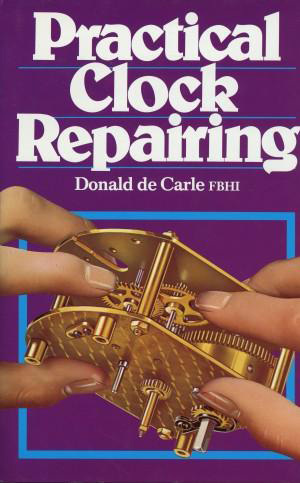 The repair of clocks calls for a variety of skills and crafts, few of which can be 'picked up' by bench work alone. In the horological trade, it is technical practice that the 'prentice hand' is first tried out on clocks, before attempting repair work on watches. Clocks have the advantage of possessing sizeable and robust parts and of being easier to handle. But there the advantage for the repairer ends. The sizes, shapes, complications and even the nationalities of clocks appear to be without end. Every movement has detail difference and, naturally, the defects when due for repair, are as varied. In this book, the author has dealt with the usual faults likely to develop in each type of movement in general use; from the lordly grandfather to the humble alarm. All the tools and equipment are described and illustrated, together with the ways of using them. The craftsman's most important and valuable tools of all - his skilful fingers - are shown in use in the clearest manner. As is usual in N.A.G. Press textbooks, the drawings have been specially made from parts under working conditions. A glance through the book will show their usefulness and clarity. Over 400 line drawings are used throughout and the reader is left in no doubt of what he is asked to do in following the author's clearly written technical and practical instructions. There are 256 pages plus over 400 line drawings.